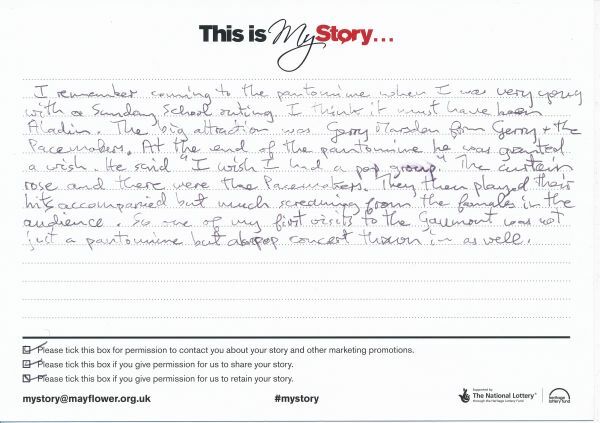 My Story Card: Bob Whatley remembers coming to see the panto with his Sunday School. I remember coming to see the pantomime when I was very young with a Sunday School outing. I think it must have been Aladdin. The big attraction was Gerry Marsden from Gerry + The Pacemakers. At the end of the pantomime he was granted a wish. He said "I wish I had a pop group." The curtain rose and there were the Pacemakers. They then played their hits accopmanied but much screaming from the females in the audience. SO one of my first visits to the Gaumont was not just a pantomime but also a pop concernt thrown in as well.